It’s an interesting experience to spend months with a single recipe book. This year I collaborated with an undergraduate student, Rachael Shulman, on a year-long research project centered around Margaret Baker’s recipe book which is held at the Folger Shakespeare Library (MS V.a.619). 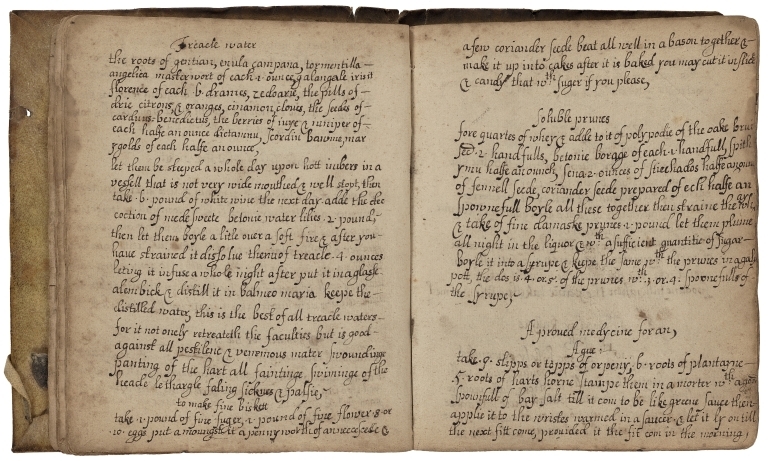 Working with the Early Modern Recipe Online Collective (EMROC) transcription interface maintained by the Folger’s Early Modern Manuscripts Online project (EMMO), Rachael and I began with transcription basics, preliminary readings, and went from there. We transcribed together and separately, we read widely and developed our own projects from the manuscript, and we’re still working on a series of blog posts (stay tuned) and an article from our shared inquiry. This spring, Rachael was awarded an award for Information Literacy by the Pennsylvania State University Libraries for her poster presentation at the annual research fair. It’s been energizing to see this manuscript through Rachael’s eyes as well as my own. I’m thankful to the Abington College Undergraduate Research Activities program (ACURA) for supporting our collaboration and for funding our trips to the Kislak Center at UPenn and the Folger to look at an array of recipe books. I’m especially thankful to the Folger for allowing Rachael to see Baker’s manuscript in person after she’d spent endless hours looking at it on a computer screen. I’m excited to continue working on this project with Rachael, and other students, in the fall. 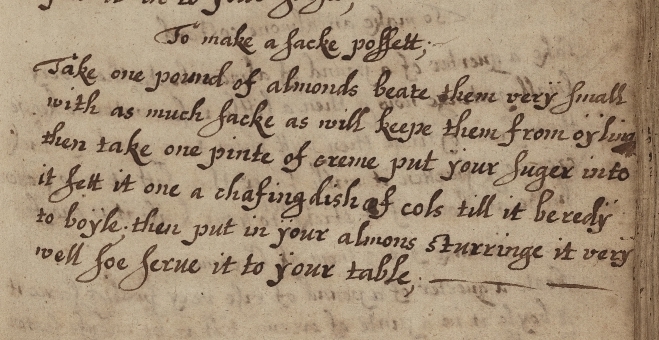 While Rachael’s research has focused on Baker’s medicinal recipes (which make up the majority of the volume), I decided to prepare two of Baker’s culinary recipes a few months ago. I opted for a posset and a biscuit. Alyssa and I have previously made possets and biscuits, but these versions stood out to me. We’ve made a “Could Posset” and a “Lemon Posset,” but not a “Sacke Posset.” We’ve made the seeded herbal biscuits “Little Cakes” and transformed Naples Biscuits into “Artificial Potatoes” and “Bisket Pudding,” but these “Fine Biskett” seemed like a nice addition to our repertoire. Combine the almonds and sack in a small bowl. Put the cream and sugar in a small pot and heat until they almost reach a boil. Stir in the almond-sack mixture. Form the dough into pleasing biscuits. I rolled half the dough into a log and sliced thin cookies. I shaped the remaining dough into cookies. Place on a baking sheet greased with butter or spray (or covered with baking parchment). Sprinkle a little bit of sugar on the biscuits. Bake 15 minutes or until the biscuits are golden brown at the edges. Neither of these recipes would make my all time favorites list. The sacke possett taste like a strange, boozy protein shake. The viscus texture was especially unappealing, although it might have improved if I’d used almond milk instead of the ground almonds I had in my fridge. I loved the flavorful spices in the fine bisketts, but the dense, floury texture of the biscuit overall showed the lack of butter or cream in the recipe. On the other hand, Rachael prepared a vegan version of this recipe and was very pleased with her results. The most important part of this process — in the archive and in the kitchen — has been the collaboration between me, my student, and Margaret Baker’s manuscript across time and space. Let me know if you try any of these recipes and improve on them! What an interesting project, I am envious. It must be amazing to taste what it was like and being able to then compare your findings with today’s cookery. If you grind almonds with a mortar and pestle (or possibly a blade grinder), you get a paste rather than almond meal. That may be what is going on here, I think it would be less grainy. Almond butter might be a modern substitute if you don’t have a mortar and pestle, but it’s a frequently used tool in my modern kitchen (which also includes a couple of immersion circulators).